This sounds like the plot line of a horror/sci-fi movie: A freshwater parasite slips through the skin and into the bloodstream. Once inside, the invader lives and breeds undetected for a decade or more, feasting on nutrients in the blood and fueling a debilitating and sometimes life-threatening illness in millions of people around the world. Except this is the true biological tale of the schistosome, a parasitic worm that has infected an estimated 200 million people. Sometimes called blood flukes, schistosome worms have been around—and infecting people—for a long time: Scientists have found evidence of them in Egyptian mummies. In 2011, more than 28 million people around the globe, the vast majority of them in Africa, were treated for schistosomiasis, the disease caused by the worms, according to the World Health Organization (WHO). Also known as snail fever, schistosomiasis is a disease of poverty, second only to malaria in terms of its toll on human health, according to WHO. The lack of clean drinking water and adequate sanitation creates ideal conditions for the parasite, which is carried by freshwater snails, to infect the body when the skin comes into contact with infested water. More than 200,000 people die from schistosomiasis each year, prompting the U.S. Centers for Disease Control and Prevention to call the infection the world’s most deadly neglected tropical disease. It is not known exactly how the parasite, part of a class of worms known as helminths, breaches the skin, or how it navigates through the body. An even bigger mystery is how the adult worms are able to live for so long inside their human hosts—five, 10 or even 15 years—without the immune system killing off the invaders. Normally, the body is pretty good at noticing when it’s being attacked. Immune cells act like sentinels, patrolling the bloodstream. When they encounter suspicious foreign cells, the body mounts a full-blown immune response to ward off the attackers. But with schistosomiasis, the body responds not to the worm itself but to the parasite’s eggs, which leads to symptoms of disease, including gut pain, chronic diarrhea and anemia. So how do adult schistosome worms manage to slip by the body’s defense system without raising an alarm? The answers to such questions could lead to new drugs or vaccines to treat or even prevent schistosomiasis. Nearly 780 million people worldwide—nearly a tenth of all inhabitants of the planet—are at risk for developing schistosomiasis. More than 90 percent of those infected live in Africa, though WHO reports the disease is also found in Asia, Latin America and the Caribbean. Because the parasites’ eggs exit their human hosts via urine and waste, people without access to clean water and sanitation are almost guaranteed to contract schistosomiasis at some point in their lives. Ten percent of those infected each year, about 20 million people, will develop acute schistosomiasis, which can cause renal failure, bladder cancer or enlarged organs. 43 million residents carry the parasite. 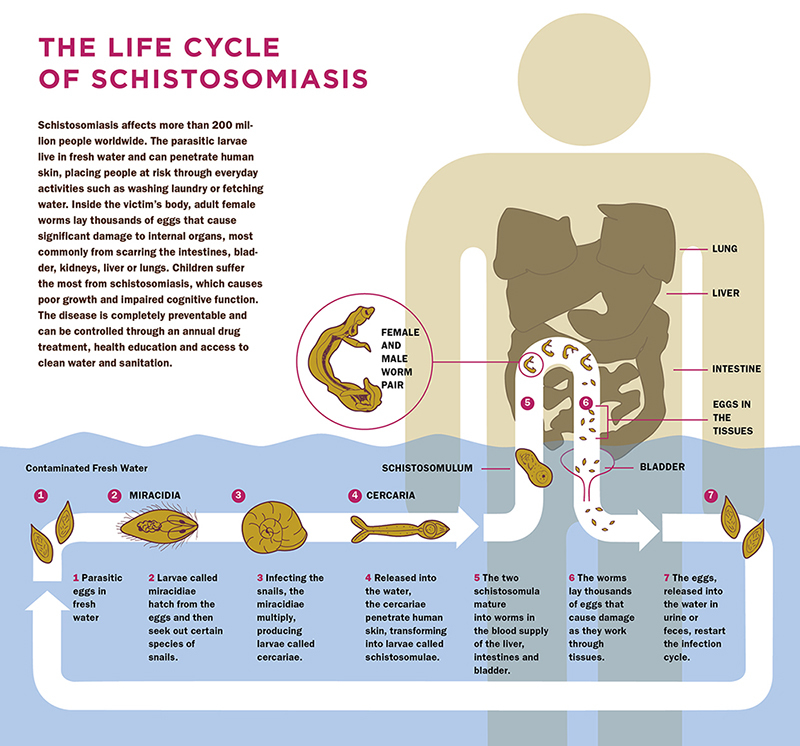 In infected adults, schistosomiasis reduces fertility and can make it difficult to perform physical labor. Both factors contribute to declines in household income, mainly in agricultural and fishing communities where the disease is endemic. In addition, there’s growing evidence that schistosomiasis significantly increases a person’s risk for contracting the virus that causes AIDS. The laboratories at Tufts and Baylor are two of just a half-dozen or so in the world working on new drugs and vaccines to treat and prevent the infection, says Hotez, who is also president of the Sabin Vaccine Institute, the global nonprofit dedicated to developing new vaccines—and increasing access to existing ones—to improve living conditions in the world’s poorest countries. Based on findings out of Johns Hopkins University, Hotez suspects the prevalence of schistosomiasis among Africans is too conservative, maybe by half. “This is the most important disease you’ve never heard of,” he says. For example, it takes mere minutes for a schistosome worm to invade the body. Once inside, the parasite travels through the bloodstream to the blood vessels of the liver, where the worm matures and finds a mate. A few weeks later, the pair migrates to their final destination, the blood vessels around either the gut or the bladder, where the female lays her eggs—several hundred in a single day. The eggs bore through the blood vessel walls and wind up in the colon or bladder, from which they exit the body as waste. The eggs hatch in fresh water, where they infect the snails and begin the infection cycle anew. And it is the worm skin that the Tufts researchers are studying—what it is made of and how it interacts with blood components—to figure out how the adults thrive unnoticed inside their hosts for so long. 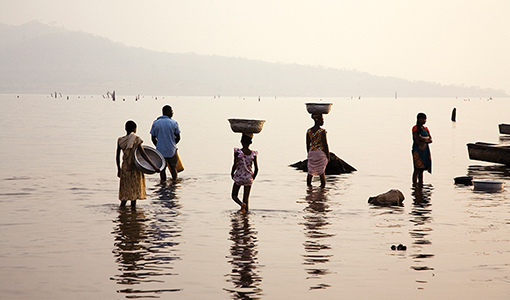 Nearly 780 million people worldwide are at risk for developing schistosomiasis. Lacking a traditional mouth and digestive system, schistosomes absorb the sugar glucose from human blood through their own skin, using specific glucose-transporting molecules as their eating utensils. It’s such a crucial function that Skelly and Shoemaker figured the glucose transporters, which act like tiny revolving doors, must be among the worms’ least furtive skin proteins. 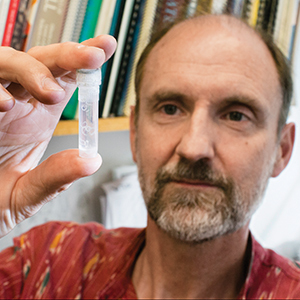 “They have to put [glucose transporters] out to make contact with the blood,” Skelly says. “They can’t hide them. If you want to get the sugar, you have to stick those things out there.” If the scientists can isolate and generate a sufficient quantity of the glucose transporter or another schistosome surface molecule, it could form the basis for developing a vaccine. In theory, introducing a single such schistosome protein into the body as a vaccine could train the immune system to react to the foreign substance. Then, should a real worm appear, the body would be programmed to recognize and attack it. Skelly and Da’darah are also looking for other chinks in the schistosomes’ armor: skin proteins that might make vulnerable targets for new drugs. In 2003, the pair pioneered a technique called RNA interference, by which they were able to switch off the parasite’s genes. Recently, they discovered a gene containing the blueprint for a certain skin protein, an enzyme called a non-neuronal acetylcholinesterase. When the scientists used the RNA interference technique to alter production of the enzyme, the worm could no longer infect the host. Now the search is on to find a way to disable that enzyme. Da’darah has screened nearly 2,000 known chemicals to see whether one might be the magic bullet. So far, he has 12 promising candidates. If any of them can interfere with the enzyme enough to compromise the worm’s ability to infect its host, it could lead to a new drug to treat the disease. Currently, there’s only one drug, praziquantel, that cures schistosomaisis, killing the adult worms in the human host’s bloodstream. It’s a great remedy if you’re an American who got infected during a trip to Africa. But if you live there, you’re likely to become reinfected the next time you come into contact with water infested with the parasite-producing snails. Humanitarian aid programs routinely use praziquantel to treat schoolchildren in high-infection countries, such as Nigeria and Tanzania. An annual dose eliminates the infection, and there’s evidence that such treatment reverses some of the growth-stunting and cognitive impairment linked to chronic schistosomiasis. “We’re doing better with mass drug administration,” says Baylor’s Hotez. “But I’ve argued that approach alone will not lead to the elimination of schistosomiasis.” And, he notes, there have been unsubstantiated reports from the field (there’s no funding to find out for sure) that the drug may not work as well as it once did, much like prolonged use of antimalarial drugs leads to resistant strains of the parasite that causes that disease. For a schistosome worm, a ramshorn snail makes a mighty nice incubator. The worm’s eggs hatch in fresh water, where the tiny newborn parasites infect the snails and emerge like tiny pollywogs, with bulbous heads and long tails. The “tadpoles” go on to infect people who come into contact with schistosome-infested water. One way to interrupt the parasite’s life cycle—and thus control the disease schistosomiasis that has infected 200 million people—would be to get rid of the snails, but that would be costly over time and might poison other aquatic animals. Another option is to prevent people from coming into contact with snail-infested water in the first place, says Karen C. Kosinski, an assistant professor of public health and community medicine at Tufts School of Medicine. Kosinski and her Tufts colleagues—David M. Gute and John Durant from the School of Engineering, Miguel J. Stadecker from the Sackler School of Graduate Biomedical Sciences and Jeffrey Griffiths from the medical school—visited Ghana in 2007 to work with officials there to rein in schistosomiasis. As they ate lunch near an outdoor fountain close to the Akosombo Dam on the Volta River, Kosinski, Stadecker and Bill Fusco, a graduate student, had a thought: If the kids had another source of water in which to play instead of the river, would schistosomiasis decline? “It would be great if everybody had access to drugs, but they don’t,” says Kosinski, who notes that even a 67-cent dose of praziquantel, the only drug that can cure the parasitic infection, costs more than many Ghanaians can afford. In many parts of Ghana, she adds, the drug is not available. When the team screened school-age children in the town of Adasawase for the disease, it found that 60 percent of the boys and 40 percent of girls were infected. The children, who often played in the Tini River, complained of painful urination. “These kids didn’t want to drink any water, because they didn’t want to have to pee later,” says Kosinski. After coordinating with local officials, Kosinski led an interdisciplinary team from Tufts, Worcester Polytechnic Institute and Noguchi Memorial Institute for Medical Research at the University of Ghana to build a concrete pool where the children could play and cool off. Johnny Crocker, E07, designed the pool so it would be filled with rainwater and be inexpensive to maintain. It opened in 2009. Just a year later, schistosomiasis infection rates among the children had dropped to below 4 percent. The team’s findings were published in PLOS Neglected Tropical Diseases in 2011. “Just because it’s cost-effective doesn’t mean it’s sustainable,” says Kosinski, who notes the community still wasn’t able to pay to maintain the pool, which is now closed. She and her team continue to work with community members in Adasawase to find a way to reopen the pool and keep it that way.